Can you attack and use a cards ability which you have to tap to use? Thanks for your interest Rothian. I went into my process for brewing one of these a little bit in the comments of the Mighty Morphin' list, but I'll paraphrase here. I've also found that throwing everything you like even a little into an over-sized list and then shaving it down over a couple revisions can help with tracking your options for picks. 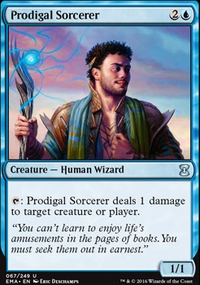 If you don't want to theme around your win-con entirely, then I think a good place to start is to look through lists of "bridesmaid" decks or cards. Stuff that just doesn't have quite enough support to be a force in any relevant format or cards that were interesting/good in draft but floundered in constructed. Low-power/pauper/peasant cube lists often have a good number of these types of cards. Throwing in pet cards that you've always loved but never found a home for can also work. 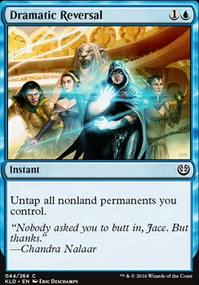 When looking for common effects like bounce spells or artifact/enchantment removal, I like to always pick the oddest version I can find that isn't just flat out unplayable. If you can find common effects with strange riders attached to them it'll go a long way to generating those fun corner-case interactions. Watch the mana cost of spells and activated abilities closely. Mana stalls are probably the most frequent thing you'll face during play, and changing your curve and/or number of mana producers is the easiest way to change the difficulty of your deck. Don't be afraid of really swingy effects. Just like in normal MTG, the careful strategy highlighted by the odd instant of blind luck are what make this game worth playing. I think it's important to recognize that 3 of your 5 targets are actually beneficial and remove themselves for little to no mana. 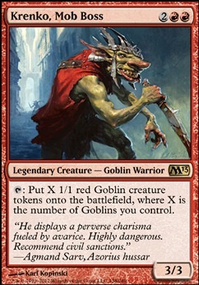 Namely Razorfin Hunter, Llanowar Dead, and Goblin Legionnaire. I would guess this allows you to put in a few more challenging blockage cards than you might imagine. You might want to try and include cards which can make Putrid Warrior's ability relevant. Since it isn't limited to combat damage, things like Pit Fight, Kiku's Shadow, or Fire Whip all let the warrior gain you life while producing some other advantage. Hope you get something of use out of this overly-long comment and good luck brewing. Hello, I've been interested in the mana maze solitaire format for a while now but haven't gotten around to making one. As I started I realized this is pretty hard to balance, handicap yourself by using some bad cards or crippling ones. Would you mind giving me a few pointers or ideas? My theme is to kill the 5 apocalypse abominations (Putrid Warrior, Razorfin Hunter, Llanowar Dead, Goblin Legionnaire, Gaea's Skyfolk), also using a good number of sets as possible seems on theme for planar overlay. I apologize for the long post below: It is not modified for standard play. Please disregard if you are playing standard only. The best deck to counter aura hexproof (what your friend has) is generally black/green sacrifice decks. See: Grave Pact, Butcher of Malakir, , Chainer's Edict <- (Pricy), Spore Frog, or Fleshbag Marauder. Or -1/-1 effects aka Archfiend of Ifnir, combined with enablers like Lotleth Troll or Putrid Imp. 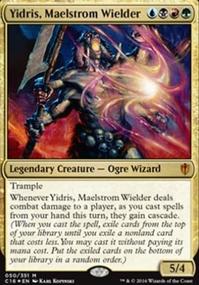 That, or a deck that has a lot of sweeper spells - Cyclonic Rift (pricy), Terminus, Living Death. Think of sweeper spells as cards that immediately level the playing field. If you're losing, just play a sweep. Instant board reset and everybody is on even playing grounds. Cheaper Alternatives: Hallowed Burial, Devastation Tide, Coastal Breach, Evacuation; just make sure it only targets creatures (not like Wash Out) because you don't want the auras returning to hand. You want to get rid of the creatures and have the auras fall off. I don't quite agree with Atrox's approach because I know most hexproof decks run Umbra auras (Hyena Umbra), and will easily have more than 3 toughness. Personally, TO COMPLETELY REDESIGN YOUR DECK, I would use no creatures and only spells or maybe with creatures with nice ETB (enter the battlefield) effects (Archaeomancer. This way, the sweepers don't affect you very much and will only remove your opponents' creatures. Red will be reserved for dealing damage, and blue will be reserved solely for sweeper spells & drawing cards. 1) It's slow. You're going to have to have multiple pingers which all take about 3 turns+ summoning sickness to start becoming active. 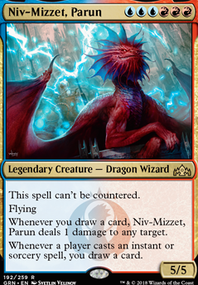 Izzet decks are supposed to be fast & maintain control from the beginning of the game. 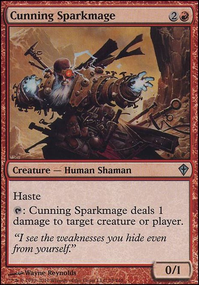 2) The synergy is a little too far apart - you want to have creatures pinging damage, you want to counter spells, you want creatures to get buff; there's only so much you can do with 7 cards in your hand. 3) No card draw - you'll run out of steam very very fast. Blue excels in card draw - you should make use of it! Here are some hate cards I highly don't recommend you using because you'd force him/her to change their deck: Gomazoa, AEther Flash, Glaring Spotlight. Modifications if you like the creature-based "ping" strategy: Consider these cards: Razorfin Hunter, Quicksilver Dagger, Sigil of Sleep, Horseshoe Crab, Pemmin's Aura, Freed from the Real. Try to find out what your style is, then start asking for tips to point you in the right direction. Add:Rabid Bite, Radha, Heir to Keld, Radiant Flames, Rageblood Shaman, Raging Kavu, Raging Regisaur, Rakka Mar, Ral Zarek, Rampaging Ferocidon, Ranging Raptors, Raptor Hatchling, Rapid Hybridization, Rattlechains, Ravenous Daggertooth, Ray of Command, Razorfin Hunter, Reach of Branches, Realms Uncharted, Ramunap Excavator, Reckless Bushwhacker, Reforge the Soul, Regisaur Alpha, Rekindled Flame, Repeating Barrage, Resilient Khenra, Rhonas's Monument, Riddleform, Ridgescale Tusker, Riding the Dilu Horse, Rings of Brighthearth, Ripjaw Raptor, Rishkar, Peema Renegade, Roaring Primadox, Rush of Blood, Ryusei, the Falling Star. Cuts:Rite of Passage, Rhystic Deluge, Root Elemental, River Serpent, Renegade Doppelganger, Reality Smasher, Ruination, Ring of Immortals, Rush of Ice, Rushing River, Rites of Refusal, Resuscitate, Reset, Read the Runes, Regenerate, Rampaging Hippo, Reach Through Mists, Relentless Assault, Remote Isle, Rhox, Riverwheel Aerialists, Reduce in Stature, Rakshasa's Disdain, Reality Spasm, Refocus, Repeal, Repopulate, Rescind, Rescue, Revolutionary Rebuff, Rewind, Rise of Eagles, Retribution, . at first i'll thank you for your support. 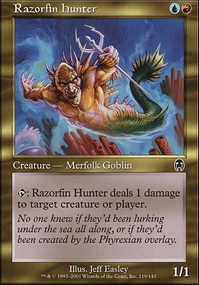 then Razorfin Hunter is a good suggestion, i did know this card before i created this deck and was never convinced that it would do a better job than Firebrand Archer in lategame but with Dramatic Reversal meh it could be a combo. Needle Drop instead could more matter, i totally place it over Refocus. i can't say that this deck would do the job against burn (i dont own this deck) so maybe Hydroblast but i am not comfortable with it. i would rather splash white for a circle. Hi, really nice deck. I planned something similar few months ago, but your deck did it better. I focused more on pingers that can target even creatures, but Sigil of Sleep did the job better. 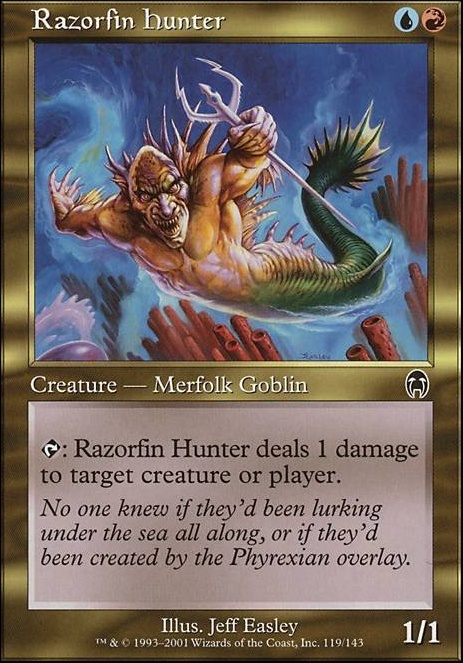 However, i suggest Razorfin Hunter instead of Firebrand Archer. And definitely this deck needs 4 copies of Needle Drop, probably instead of dream's grip or refocus. And go Hydroblast in sideboard, red burn spells are deadly here.